The last Sunday of my summer holiday, and I was in York. Since I have friends who live near York and a family member who lives in the city I visit sometimes and have attended a weekday Eucharist at the minster several times, but I had never been to a Sunday service. When I made plans to stay in York over the weekend I realised I could go to the Minster on Sunday morning. I decided to go to the main service of Holy Eucharist at 10am. I arrived at about 9:45 and spent a few minutes outside, listening to the bells. It’s one of the joys of attending church in the UK (and other European countries) that there are often teams of bell-ringers and joyous peals are such a wonderful way to begin worship. A parish church can produce a wonderful sound, but a cathedral is something else. Standing outside the Minster, under a vivid blue sky and in bright sunshine I felt excited to be there and really looked forward to going inside. The welcome. How would the Minster welcome visitors? Surely they must be used to it. A first for me, there were members of staff outside the building, giving people information about where to go, the times of services etc. Once inside, I spoke to the two people at the back of the church and they directed me forward to more greeters. Apparently everything I needed for the service would be found in the pew. So, onwards, and directed further towards the front by more people. I was encouraged by an elderly gentleman to go even further forward because there were empty seats there. I thought this was a good way of keeping everyone together, by filling up the pews from the front, rather than letting people scatter themselves about. Seeing that there were seats just a few rows back but on the left side, I decided to walk right to the front and then go round to the side to sit down. I reached the front, turned left and there he was, right in front of me: the Archbishop of York John Sentamu. I couldn’t just walk past him, so I walked up and said good morning, and shook his hand. I asked him if he was preaching, but he said he wasn’t, because he was beginning a week-long prayer vigil for peace. However, he would be at the service. I asked him to bless me and he did, and I walked to my seat feeling very blessed indeed. On reaching my seat I was really happy to see that there were kneelers, so no need to kneel on a cold stone floor this Sunday. Before the service started I had time to look at the service booklet (for yesterday only) and the pamphlet containing the Eucharist service. There was enough information about how to receive communion, as well as who was celebrating (the Dean) and the visiting choir. Just a few minutes before the service, another priest made an announcement about the beginning of the service, because it would be a little unusual. We would start with prayers from the Archbishop, then the Lord’s Prayer in Arabic by a bishop visiting from Egypt, then a piece of classical music. It was all rather lovely. After this unusual start, the service continued normally. The music was beautiful, the choir was wonderful, and to hear their voices soaring was incredible. The sermon was interesting, about servanthood. I particularly liked the way the sermon ended with questions to mull over about what servanthood meant for each of us. The communion itself was administered efficiently and I was surprised at how little time it took for everyone to receive and return to the pews. There seemed to be a lot of people who attended the Minster regularly and knew the drill, as well as more sidespeople discretely ushering everyone about. There were three priests administering the host, and for each one there were two people administering the chalice. I noticed that the Archbishop had left the service several times (to go to pray in a side chapel I think) and he returned to receive communion after everyone else. At the end of the service there was of course an organ voluntary, and people were already starting to leave. I held my breath because at many churches there is a round of applause for the organist at the end and I hate it, but the voluntary ended and there was nothing, just people greeting their friends and leaving quietly. As I turned round I found myself facing an elderly woman, who apologised to me for not greeting me at the Peace. I assured her that it was fine, but she insisted that it was not, and that she really should have greeted me. We exchanged a greeting then, and went our separate ways. 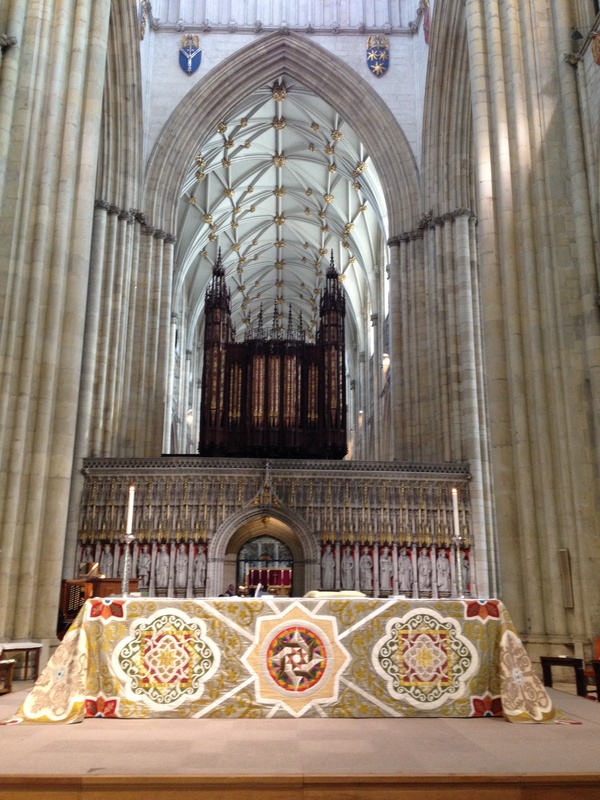 I looked around the Minster a little more then left, feeling quite elated. It was a lovely service, the music was wonderful, the sermon was thought-provoking, and of course I met, and was blessed by the Archbishop. I am already looking forward to my next visit to York and will definitely try to be there over a weekend so I can go again. So that is the end of my summer visits to other churches. Next Sunday I’ll be back in Tokyo and at the church where I’m a member. I have lots to think about after being at so many different services, and feel very grateful that I have been able to go to church every week. I’m also feeling much more at home within the Church of England, after many years of not quite connecting. The NSKK (Nippon Sei Ko Kai, the Japanese Anglican Church) is my home for most of the year, but when I’m back in the UK the Church of England is home too. It’s good to be back on the mother ship. This entry was posted in Travel and tagged Archbishop of York, Church of England, Holy Eucharist, John Sentamu, welcome, York, York Minster by tokyopurplegirl. Bookmark the permalink.